A heavy duty camera bag that does sturdiness in style, the Astoria is ONA's largest messenger bag to date, designed to meet the demands of a jet-setting photographer. 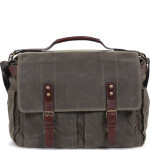 Accommodating two cameras, five lenses and a laptop of up to 13 inches, this tough but attractive messenger rises to the challenge of any shoot or project. Fully customisable and adjustable, it’s a premium multi-purpose bag. Handcrafted with a quality waxed cotton canvas, the weather-resistant exterior is both sturdy and smart, complete with attractive leather accents. Comfortably carry all of your equipment with the adjustable shoulder strap, using the handle for extra support, or slot the luggage sleeve onto your suitcase. Customise your bag to create a snug and secure fit for your camera, laptop and equipment, with eight padded, removable inserts of various sizes. Securely store and organise your personal items with two expandable pockets and a zipped pocket on the front, and a discreet slot to the rear. Two brass slip-lock clasps with adjustable buckles allow for convenient access and a close fitting when on the move. A large messenger style bag built to withstand the fast-paced lifestyle of a photographer, the Astoria is a practical camera and laptop bag with much aesthetic appeal. 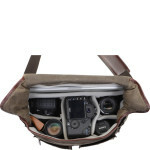 This customisable bag includes eight removable Velcro inserts; a pouch accommodating a laptop of up to 13”, and compartments for two cameras and five lenses, each padded for protection. Combined with weather flaps and water-resistant waxed canvas, the Astoria offers peace of mind when carrying your equipment. A further two pockets and zipped pouch on the front offer storage for personal items and accessories, whilst the rear pouch has a bottom zip to create a luggage sleeve for travel. 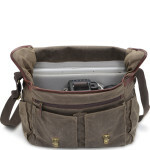 Sling over your shoulder or use the grab handle; it’s an adaptable bag for shoots, overnight stays and daily use. 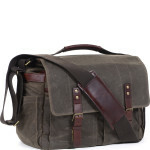 The waxed canvas and full-grain leather exterior are designed to age gracefully with wear and tear. However we advise against machine-washing your bag. Instead, use a damp cloth to remove excess dirt. A leather wax will prolong the appearance and quality of the trimmings; for the canvas, apply a specialist waterproof treatment every few years. 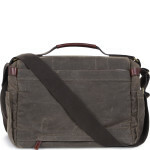 ONA takes its name from Swahili, and means ‘to experience with the eyes.’ Its quality camera and laptop bags are designed to complement the lifestyle of the modern photographer, with products that look and feel good, and stand the test of time.